There are multiple payers that fund the services that hospitals provide to patients. In California, the four main types of payers are: private (ex. employer-based), Medicare, Medi-Cal (California’s state Medicaid program), or uninsured (no payer). Depending on how their patients are insured, hospitals are reimbursed differently. Private payers typically cover the costs of care most effectively. Medicare – which covers seniors and some persons with disabilities – typically reimburses hospitals close to the cost of providing the care. Medicaid, on the other hand, does not adequately reimburse hospitals. In fact, California has one of the lowest Medicaid reimbursement rates in the nation, ranking 47th out of all states.1 As a result, California hospitals are unable to recoup most of the basic costs of providing care to Medi-Cal patients. Unfortunately, treating uninsured individuals is especially costly for hospitals, because they receive almost no revenue to cover costs. What makes children’s hospitals unique? The distribution of funds that hospitals receive from various sources is referred to as payer mix. 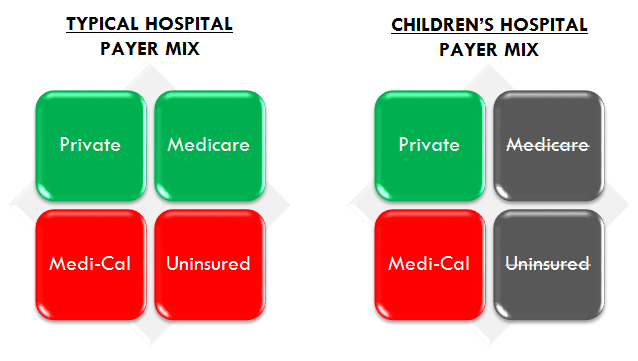 Children’s hospitals have unique payer mixes compared to typical hospitals. Fortunately, all children in California are insured under current law. Therefore, children’s hospitals typically do not treat uninsured patients. Also, because they do not treat seniors, children’s hospitals do not receive reimbursements from Medicare. Consequently, children’s hospitals are heavily reliant on Medi-Cal for funding. This can lead to challenges to long-term financial sustainability because the children’s hospitals patient populations average about 62% on Medi-Cal. For more information on Medi-Cal, please click here. The Children’s Hospitals Graduate Medical Education (CHGME) program funds independent children’s teaching hospitals to support the training of pediatricians. To learn more about CHGME, please click here. Our children’s hospitals rely on thoughtful donations to support our young patients. Charitable contributions help fund vital medical equipment, ranging from everyday supplies to innovative, life-saving technology. Furthermore, donations are used to sustain essential services, such as patient advocacy efforts, community outreach, and training. These services are imperative for ensuring the health of not only our patients, but all children in our state. Additionally, donations are used to fund groundbreaking research.